Velocita 250 will be coming to our market. Wait what is Velocita? We are sure that most people out there have absolutely no clue about this bike and sadly, us in Malaysian Riders do agree that this is a new bike that we haven’t got the chance to get to any information about it accept for one advertisement in a local online shopping site. After researching about the bike and the distributor of the bike, we found no signs of origin and legitimate information available for us to share for now. Us in Malaysian Riders have a suspect that the bike would probably comes from China, why are we saying that? Looking at the price tag given from the advert, RM11,999 for a 250cc is around the same price of a ninja 250r in the US. As we all know, Malaysia is a country where the tax can be as high as 100% for a vehicle. Making the price of the bike Velocita seems to be way too cheap to be coming from a European or American firm. Therefore, a China made bike would fit the description. Our editors and some of our avid readers had speculated that the bike may be a rebadged of the Geneta RC250. Whatever the bike is, we will try to get as much information as we can and find out about both bike and distributor of the brand. Stay tune with us for more info and news in the upcoming future. 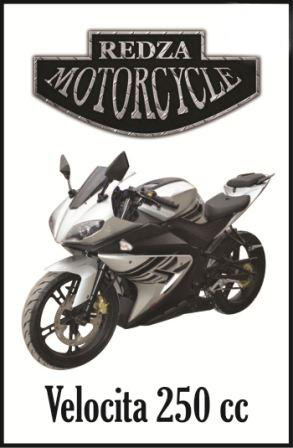 On behalf of Redza Motocycle (RMC) management we would like to clear your pre assumption on our products. Kindly be inform Redza Motorcycle (RMC) is a business unit under Business Equation Sdn. Bhd (622585 – X). RMC are 100% locally assembled in Rawang, Selangor. We have obtained assembly license with MIDA (Malaysian Industrial Development Authority). Having obtained this MIDA license for CKD (completely known down) and under Custom tariff code 8711.30.910, which we are entitled for only 5% import tax and resonable profit margin (unlike others brands high price for high profit) that is why we have decided sell at a very competitive price. RMC have colaborates with Italian company for our own design as well as we are using Japan technologies in terms of engine. Engine type : 165FMM Single Cylinder, 4 Stroke, water cool, CBB counter balance shaft engine. Engine type : Single Cylinder , 4 Stroke , air cooled. RMC will be launch officially by mid of June 2012 location will be at Tesco Ampang, Selangor. Meantime our show room is still under renovation which is only be ready in early of July 2012 located at Desa Pandan. With this explanation we hope everyone have a very clear understanding about our RMC. Looking forward for your support and welcome to our official launch soon!! aku heran knp velocita 250cc just max speed dia 80km/h.. 250CC ok..
cuba bukak ni n baca product details..
will you tell me about your dealer in miri sarawak? Roadshow at bintang megamall miri,yesterday i just saw it bro. Do you think WONG MOTOR supply this bike? How about others workshop in miri then?